Aberdeen manager Derek McInnes says getting to the Scottish Cup final would be "pretty special". McInnes's men face St Johnstone in Sunday's semi-final, having already beaten the Perth side in the League Cup semi-finals. "We've played a lot of big games this season but none more so than this one," explained the former Saints manager. "In most people's eyes, we'll be favourites but I don't think there's a lot between the sides." A 4-0 win at Tynecastle over Tommy Wright's St Johnstone propelled the Dons into the League Cup final, which Aberdeen won on penalties after a scoreless stalemate with Inverness Caledonian Thistle. "We've showed up well in cup football this season," reflected McInnes. "We never lost a goal in the League Cup, we've only lost one goal in the Scottish Cup against Celtic at Parkhead. We've earned the right to fight it out in the semi-final stage. "One defeat since the back end of December shows we're in fine fettle and in decent form. "Hopefully we can bring a performance that we know we're capable of and if we do that then we'll give ourselves a chance to progress but St Johnstone are a good side. We give them every respect. "I've worked with a lot of their players, I know exactly how motivated they are and they'll see that as their chance as well to get to a final. It's finely poised. "We've shown that we can handle games like the last semi-final, occasions like the League Cup final and even going to Celtic Park and winning. I think we can draw on those experiences to help us." Though St Johnstone have yet to score against Aberdeen this season, McInnes doubts whether they will need any "extra motivation" to get to May's final. 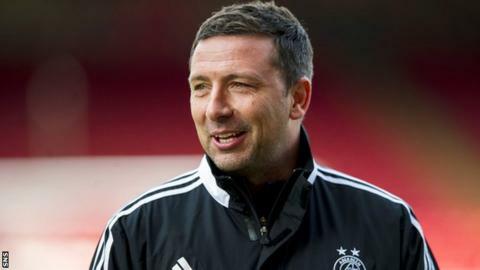 "We know that St Johnstone will feel that it must be their time some time," said McInnes referring to St Johnstone's defeats in their last seven semi-finals over the past 15 years. "We've had decent results against them, a couple of decent performances. Some of the goals we've had to score to beat them have been of real quality. "They ordinarily don't give a lot away so I'm expecting a tight match in terms of chances and we've got to try and make sure if chances come along we can be as clinical as we were in the last cup game [against St Johnstone]. "If we're not at it, we can be a team that can be punished. "There's still a lot to earn, but at the same time there's still a lot we could miss out on. "We've happy with the consistency the boys have shown. They really are a brilliant bunch of boys. They're very committed, very professional. They're motivated to do well and while we've got that collectively now as team, we're determined to go the full way right to the end of the season." Aberdeen's solid defensive record this season is a source of "pride" for defender Mark Reynolds and the 26-year-old also draws confidence from his team-mates. "All season, we've been difficult to break down," he said. "That's one of our strengths and one of the reasons why we're enjoying the success we're enjoying. It's something that we're going to need to keep the same if want to get through the final. "We can rely on the strikers to score goals so there's a confidence there that when the job needs to be done, we've got the players to do it."